Black, No Sugar. 2015. Socially Engaged Work Involving Conversations Over Coffee in Vienna, Austria. Black, No Sugar (2015) was created as a performative installation featured in Nassau Calling: Art in the Bahamas [re-] Visited at Hilger BrotKunsthalle in Vienna, Austria. Using the coffee culture of Vienna as a point of intervention, I met with 30 people living in Vienna ranging from artist, politicians, workers to Syrian refugees immigrating throughout Europe and conversed about topics ranging from the mundane to the intensely political. 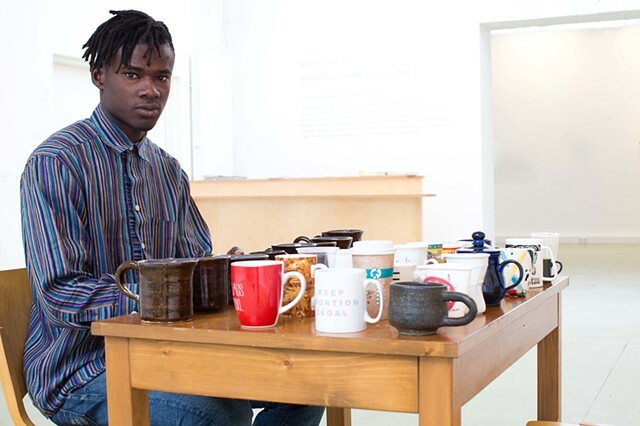 I made the initial 30 ceramic mugs which were later exchanged with each participant in this project.